In 1941, the popular Austrian Jewish writer, Stefan Zweig, with his young wife, Lotte Altmann, went into hiding from the Nazis in Brazil, where less than six months later they committed suicide in a final act of despair. 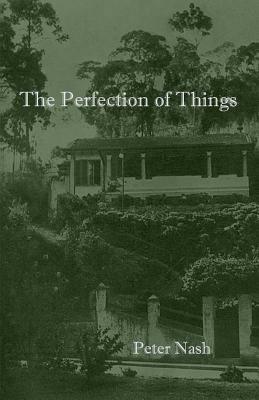 The Perfection of Things is a novel that opens in February of 2004 in the Brazilian town of Petr polis where a dying American biographer, Adam Ribeira, has been living in a last, desperate effort to complete a critical biography of Zweig, which he has been writing in frustration and anguish for nearly twenty years. Working by day in a rented apartment directly overlooking the now-empty house in which Zweig and his wife committed suicide, and by night inside the house itself, into which he sneaks the moment it is dark, the narrator struggles, once and for all, to grasp the tangled implications of Zweig and his times, a realization that finally compels him to act. Part fiction, part biography of Zweig, part critical inquiry into the scope and limitations of biography itself, the novel explores what for many is the essential impossibility of truly knowing another human being. Framed in the form of a letter to the narrator's estranged son in Israel, in the form of a tzevaah, a Jewish ethical will, the story is also a meditation on contemporary life-on racism, exile, and war. Binding the tale together is the perennially bewitching idea of perfection and its place in the human heart. Peter Nash is the author of a biography called The Life and Times of Moses Jacob Ezekiel: American Sculptor, Arcadian Knight. He has recently completed a novel about a failed American biographer of the Austrian-Jewish author, Stefan Zweig, called The Perfection of Things. He has published poems and stories in Desideratum, Berkeley Poetry Review, The Avalon Literary Review, and The Minetta Review. In 2012, he co-founded and now writes a bi-weekly post for a literary blog called Talented Reader. He lives in New Mexico with his wife and two sons.